Kal Kallaugher pretty much encapsulates the political situation, at least for the next few hours. 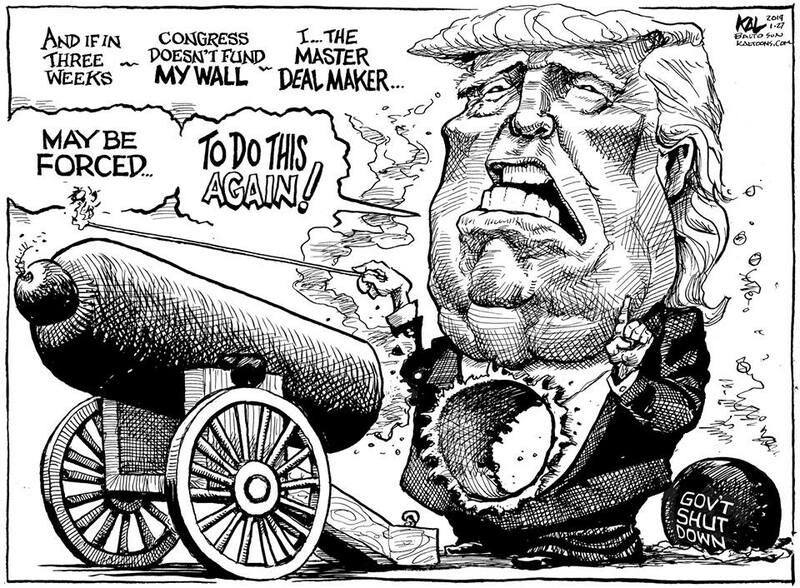 A lot of good shutdown cartoons have become irrelevant, and there’s some question as to whether they will spring to life again in three weeks. I’m reminded of a bully who picked on a kid for a couple of weeks until finally he managed to tease his victim into a showdown in the parkinglot before a crowd of cheering schoolmates, whereupon the apparent victim’s first blow was a solid right cross that smashed the bully’s nose, ending the fight. I hope we’ve reached a point where enough people in the GOP have the same response. On the other hand, I’m sure the firehose of scandal and outrage won’t shut down and cartoonists will continue to struggle to keep up. 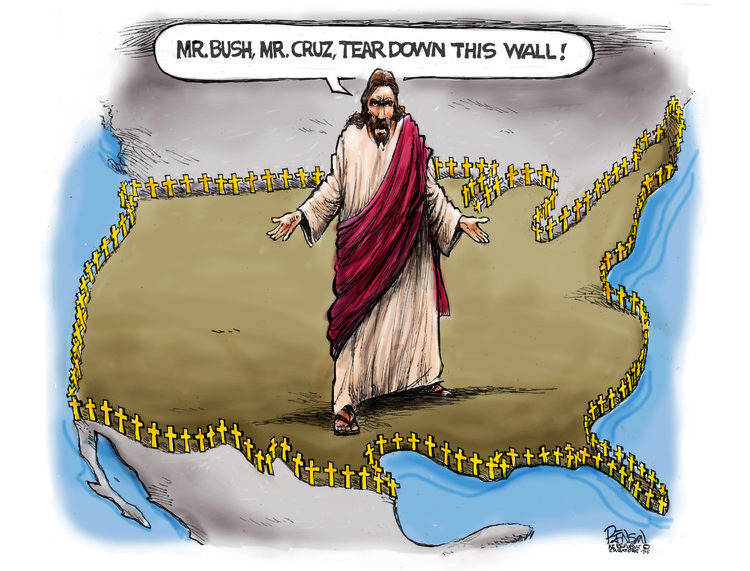 If there are any cartoonists left. Michael Cavna is only one voice commenting on Gannett’s slashing of staff, and Pat Bagley penned a most eloquent and outraged response to the Arizona Republic’s firing of Pulitzer-winning Steve Benson. Regular readers know I place little value on prizes, but I do respect them as ways to impress the brass, and it’s scary to think we’ve reached a point where the editors’ and publishers’ blind allegiance to corporate beancounters has negated the value of such things. There was a point, before the stock-swappers had completely taken over the industry, when I worked for a paper in a small privately held chain, the uninvolved heirs to which, having consulted Warren Buffett, decided to kill the goose and run away with however much gold it contained. While we were up for sale, we had very little chance of updating our computers or our press, because they were fixated on keeping profits high and expenses low, so ditto to cost-of-living adjustments, not to mention actual raises. Whoever bought us was going to have a lot of catching up to do. My publisher there took early retirement rather than destroy her paper, so I bailed out and went to a privately held paper which, a few years later, was sold to a chain, after which another good publisher quit rather than knuckle under to self-destructive corporate demands. By now, there aren’t many places left to run to. We’re near the point where the vultures are simply there to scrape out the last bits of money before the tottering wreck collapses completely. This thread from Twitter is as good an analysis as I’ve seen. If he and I were face to face, I’d have some nits to pick, but it would be a conversation, not an argument. 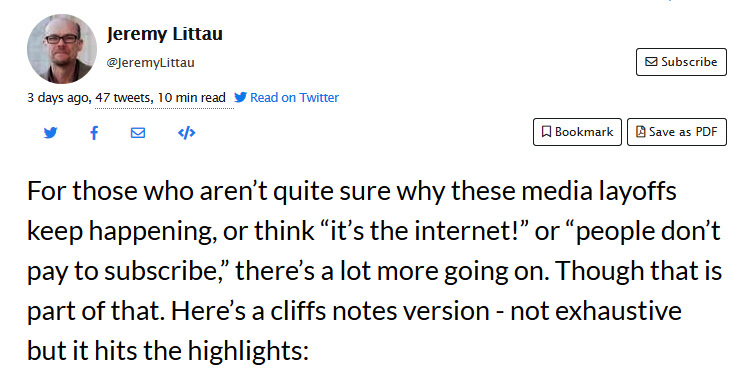 The demise of newspapers, as Littau suggests, includes a lot of stupid, blind decisions and the mortal wounds are largely self-inflicted, which leaves the encouraging idea alive that people truly do want information. 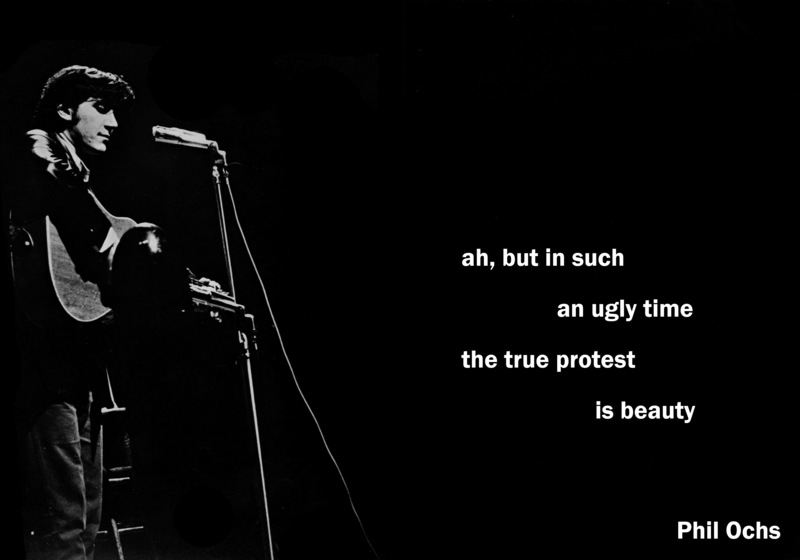 What I see as the barrier to national discussion is the fragmentation of media, but there is a chance for some sort of samizdat to arise, and, while the days may be gone when a cartoonist had a staff position to pay the rent and buy the groceries, there are still outlets for driven artists to be seen and heard. That assumes, however, that cartoonists disappear from newspapers and readers recognize the need to seek them elsewhere. A more chilling, but far less common, development, is when a newspaper like the Pittsburgh Post-Gazette fires long-time, popular cartoonist Rob Rogers because they want someone to lecture their readers with graphic Orwellian newspeak. 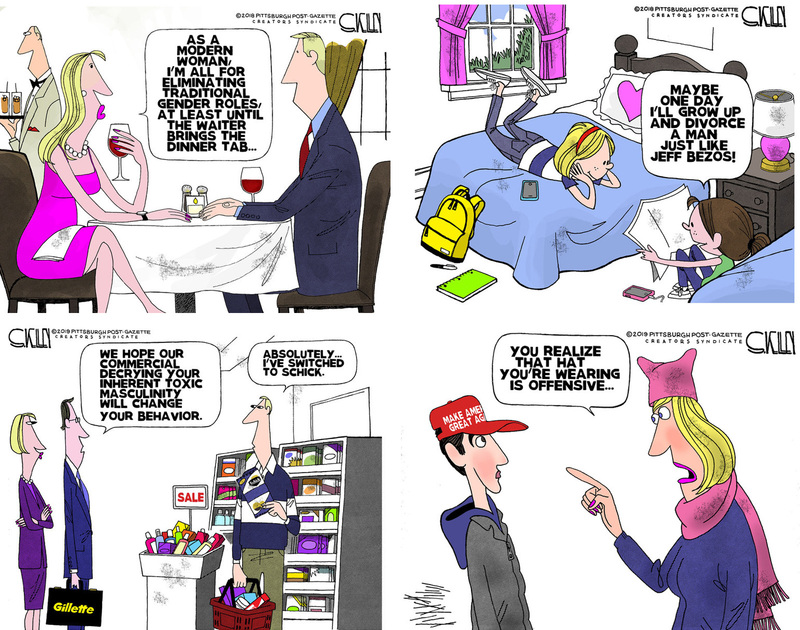 There, despite floods of letters from readers and a rare public objection from the newsroom, the editorial page has published a series of cartoons from Steve Kelley, not only pushing a solid GOP political line but insulting women with jokes that seem resurrected from the 1950s. DD Degg has been following the story and his updated account offers several examples of the swelling outrage. Well, outrage is better than silence. Angry people will seek their cartoons elsewhere. I can’t say how it works for cartoonists, but today’s Between Friends certainly depicts how it works for writers, except that I do get through my morning coffee while it’s hot. It’s in the afternoon that I leave a regular collection of dead tea bags soaking in lukewarm water by the kitchen sink. Given the number of major cartoonists who have praised McCloud’s book, I’m pretty sure my inability to get through it is related to why I changed my major from English to Great Books: I don’t like studying structure. Even when I was majoring in classics — where we discussed what they said rather than parsing how they said it — I got in trouble with a Joyce scholar for writing that “Ulysses” was no more a “novel” than the Statue of Liberty was a “building,” which I intended as a compliment. I enjoyed pulling apart Joyce, because he invites it. But pulling apart Yeats felt like dissecting a hummingbird: You may learn something, but it will never fly again. All of which is to say that my response to “Understanding Comics” is not that of most comics fans, but I read Horrocks’ piece with a great deal of interest. In general, the best critiques come, as in this case, from admirers rather than opponents. Whether you are a cartoonist, or a comics fan, this is well worth your time.